Professor Shon Hopwood and his former client, Matthew Charles, celebrate at Georgetown Law on February 6, the day after Charles was recognized by President Donald Trump at the State of the Union Address. Sentenced in 1996 to 35 years for selling cocaine and firearms offenses, Charles served 21 years before being released in 2016. Charles rebuilt his life — only to be sent back to prison in 2018 after a judge determined that the release was improper. The return of this 51-year-old Nashville churchgoer and soup kitchen volunteer to jail, to serve the final nine years of a 35-year sentence, caused a public outcry of which Hopwood was well aware. So Hopwood stepped up and became Matthew Charles’s pro bono lawyer. As spring turned to summer, Hopwood filed a clemency petition for his client. He thought he had a good chance of getting Matthew Charles freed. Hopwood’s research assistants, Margo Rusconi (L’19) and Tiffany Trump (L’20), helped work on Charles’s case. As summer turned to fall, Hopwood was also coordinating with FAMM, the White House and legislators on the Hill to advocate for a bipartisan federal prison reform bill that would help former federal prisoners reenter society and modify sentences for certain offenses. But even Hopwood could not have envisioned the outcome. The First Step Act was signed by President Donald Trump on December 21, 2018. Matthew Charles was lawfully resentenced to time served and released from prison on January 3, 2019 — the first person to be released under the First Step Act. On February 5, Matthew Charles was the guest of the president at the State of the Union Address. The pair told Matthew’s story in a Facebook Live conversation. After the legislation passed, Charles’s federal defenders alerted Hopwood that they planned to file a motion under the statute to get their client resentenced. The motion was filed and the government conceded, agreeing that Charles should receive time served due to his record of rehabilitation. In the video, Charles and Hopwood discussed the need for further criminal justice reform. “It’s an exciting time to be in this advocacy space,” Hopwood said, noting that it is the inspiring stories of people like Matthew Charles (and, we might add, Professor Shon Hopwood) that resonate with others. While he’s not contemplating law school like his former lawyer, Charles has a new job as a spokesman for FAMM, in addition to doing media interviews. The message that he wants people to take away from his story? 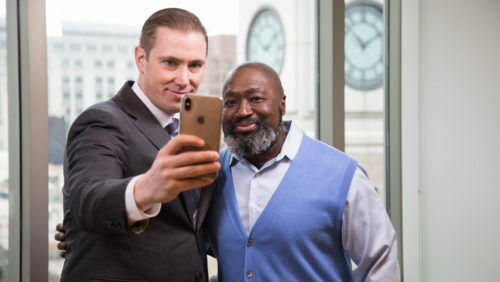 Matthew Charles spent more than two decades behind bars before a bipartisan criminal justice reform bill became law, allowing for his release.#GeorgetownLaw Professor Shon Hopwood, also formerly incarcerated, was one of Mr. Charles' attorneys. They'll sit down together on 2/6 to discuss the future of criminal justice reform.Send your questions in the comments below.